Home » Academics » Schools » College of Arts, Humanities and Social Sciences » Faculty » Daniel Long, Ph.D.
Daniel Long, Ph.D., Assistant Professor of Music and director of Choral Activities of the Music Department, has devoted much of his professional life to the study of interpretation, historically informed performances and promotion of choral, instrumental and early music. As a conductor, vocal soloist and chorister, early historical keyboardist, and musicologist, his studies, lectures and performances have taken him to numerous academic and concert halls throughout Europe, Canada and USA. He received his Bachelor of Music degree in Sacred Music from Drake University, his Masters of Music in Orchestral Conducting from the University of Texas at Austin, and the Doctor of Philosophy in Musicology from the University of South Africa on the subject of baseball music. In 2006, Long was the Field Director of the London Studies Abroad program, and also the recipient of the 2008-09 Distinguished Faculty Award presented by the St. Mary’s University Alumni Association. Long has studied with such noted conductors as Leonard Bernstein, Margaret Hillis, John Canarina, Fiora Contino, Walter Ducloux and Helmuth Rilling. He has collaborated in performances with some of the leading early music interpreters. Long has also studied early historical keyboard playing with international recording artists Marie-Claire Alain, Martin Hasselbeck and Kenneth Gilbert. Long has devoted much time and energy to promoting gifted young artists. He created a renowned young artists’ competition and series of children’s concerts in Austin, and from 2000 – 2003, he was an adjudicator and Master Class teacher at the famous IBLA Grand Prize Competition for young artists in Ragusa, Sicily. 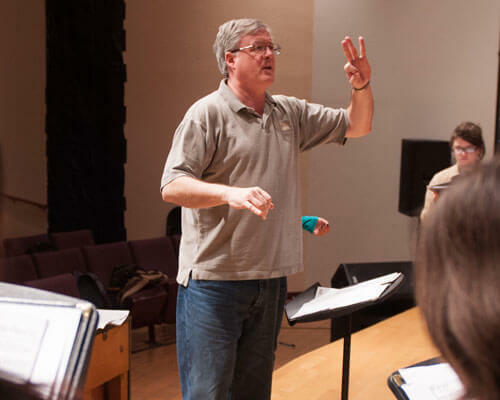 As onetime Artistic Director of the Texas Bach Choir and Collegium, Long and the ensembles have made recordings and received high praise in a number of newspapers. As a musicologist, Long has lectured at several early music festivals, written articles for early music journals, reviewed the latest early music CDs released to the public on amazon.com and writing a book on the musical and spiritual symbolism found in Handel’s Messiah. He has also started literary projects: a chronology of baseball music, anotations of the sacred cantatas of Johann Sebastian Bach, and the banned music by the Nazis in the 1930s. He has appeared seasonally as a guest on “Musica Antiqua”, a radio show devoted to early music on KPAC (Wednesdays, 9:00PM on 88.3 FM). Long is also currently the Artistic Director of Antigua Tejas, a professional early music ensemble. Besides European early music, Long has become one of this country’s leading pioneers in the rediscovery of American early music from the Thirteen Colonies, Mexican colonial music of Nueva Espana, and transcription of Shaker music. Long is also Founding Member of Early Music America, and a Contributor to the Research Library at the National Baseball Hall of Fame, Cooperstown, NY.